If you’re off to see the wizard like this eclectic group of characters is, you’ll want to take this delightful and colorful 7 3/4-inch wide x 6 3/4-inch tall x 4-inch long Wizard of Oz Gen 2 Fun Box Tin Tote with you. There’s no place like it for your lunch and snacks! Ages 14 and up. 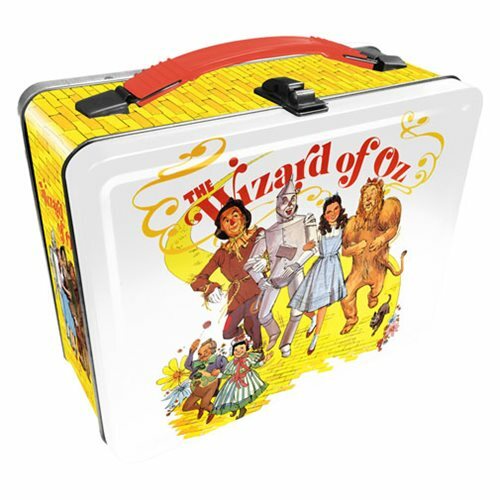 The Wizard of Oz Gen 2 Fun Box Tin Tote can be delivered to the UK, Ireland and Overseas. All the products we sell are authentic and we want you to be fully satisfied with every purchase you make. If the item you receive is not suitable for whatever reason, you can return it within 30 days and you will promptly receive a refund or it can be exchanged for a different item of your choice.